How hot is too hot to play? "Early Show" Consumer Correspondent Susan Koeppen found, despite the temperature outside, playground equipment can still reach extreme temperatures -- a severe risk for kids who use them. 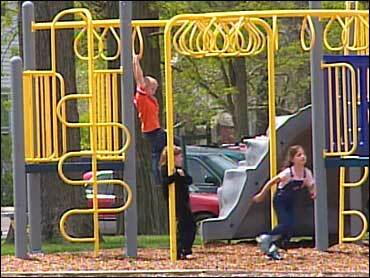 Koeppen said most people know playgrounds made with metal and plastic can get hot in the sun. However, the outcome of using equipment that's been steadily heated by the summer sun can be alarming. Koeppen shared the story of Madyson Gomez, an 18-month-old who is currently wearing mitten-like coverings on her hands to protect them as she recovers from second-degree burns. Gomez sustained her injuries after spending mere moments on a slide at her neighborhood park in Des Moines, Iowa. Nicole Hollingshead said, "This happened in a matter of seconds -- literally seconds." Madyson suffered burns that blistered on her hands, stomach and knees. "She was screaming," Hollingshead explained. "She was screaming on her way to the emergency room." Even though the day Madyson was burned was only 80 degrees, the plastic slide had reached a temperature of more than 160 degrees. Hollingshead said, "How could something like this happen. How can a slide be so hot that a second degree burns? " Playground safety advocate Geoff Croft explained children can get burned in a matter of minutes on anything over 120 degrees. "Over 140 degrees," he said, "it can take a matter of seconds." Croft, of NYC Park Advocates, a non-profit advocacy organization, says safety mats are one of the most dangerous spots when it comes to burns. Koeppen decided to test it out for herself. On a relatively cloudy day in New York City, with temperatures in the low 80s, she found black safety mats had already reached 140 degrees by noon. Koeppen asked Croft, "What can happen to a child's skin if they touch a piece of equipment that's at extreme temperatures?" Croft replied, "Literally, the skin can peel from a person's hands, face, arm, feet." Unlike New York City, Croft says most playgrounds don't warn against the dangers, leading to a huge problem across the U.S.
Croft said, "Parents should be aware these are some of the hidden dangers when you go out to a playground." Madyson's mom agreed, saying, "I want someone to realize how serious this is. I want to warn parents who may not be aware of this. This could happen to anybody." Koeppen added on "The Early Show" that safety advocates say that playground equipment can be made with materials that don't get so hot. They would like to see playgrounds tested for heat before they are put into place. So how can you keep your kids from being burned at the playground? Koeppen said parents should look for parks that have lots of shade. Parents should do a touch test on playground equipment before they let their kids play on them. Also, children should keep their shoes on while playing.